Middleton will still take a large contingent to the state meet, which will be held Saturday at 3 p.m. at the UW Natatorium. The Cardinals’ challenge of three-peating just got a whole lot harder, though. With its full complement of swimmers, Middleton would have been the consensus state favorite. Now, with the Cardinals one relay short, Cedarburg is a two-point favorite over Middleton when you calculate where teams are seeded. “You never want this to happen at such a high-stakes meet, but we cannot change it,” Cabalka said. “All we can do is refocus, move forward and fight with everything we've got. Not much got in the way of several Cardinals at sectionals. And Middleton hopes to carry that momentum to state. Middleton’s 200-yard medley relay team of junior Gabriela Pierobon Mays, junior Alex Anagnostopoulos, sophomore Ally Silverstri and junior Berkley Smith was second at sectionals and is seeded fifth at state. The quartet of Smith, senior Cora Mack, senior Hannah Aegerter and senior Makenna Licking was second in the 200-yard freestyle and is seeded second at state. 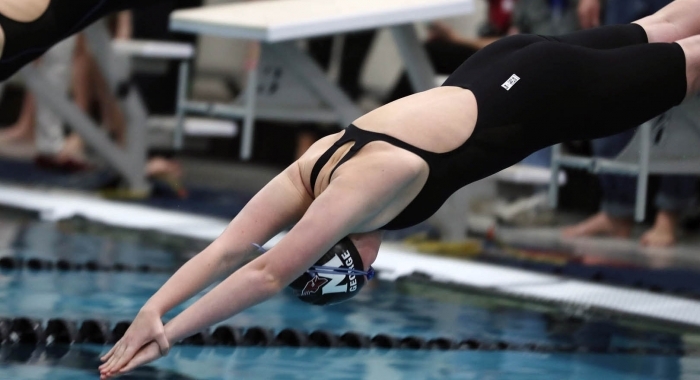 Aegerter won the 200-yard freestyle, while Licking was fifth and sophomore Bella Chirafisi was ninth. Aegerter is now the No. 1 seed at state, while Licking is seeded 14th. Aegerter also won the 500-yard freestyle, while Licking was second, freshman Amanda George was fifth and senior Emily Keebler was 11th. Aegerter is seeded second at state, Licking is third and George is 14th. Silvestri was second in the 200 IM, while senior Emily Keebler was sixth, Anagnostopoulos was eighth and sophomore Madelyn Lawn was 10th. Silvestri is now seeded fifth at state, Keebler is 12th, Anagnostopoulos is 18th and Lawn is 21st. Silvestri was second in the 100-yard breaststroke and Anagnostopoulos was third. Silvestri is seeded second, while Anagnostopoulos is seeded seventh. Pierobon Mays was third in the 100-yard butterfly and is seeded 10th at state. Pierobon Mays was also third in the 100-yard backstroke and is seeded ninth at state in that event. Smith was fourth in the 50-yard freestyle and is seeded 12th. Mack was fifth in the 100-yard freestyle and Chirafisi was 10th. Mack is now seeded 19th at state. “We went into this meet with the goal of getting all 21 races through to the state meet and leaving no one behind,” Cabalka said. “We've never done that before and we knew we’d have to tap into a new gear and swim flawlessly if we wanted that to become a reality. “The girls started off incredibly strong and held tough throughout the entire meet. We had some absolutely amazing swims and the energy was incredibly high. We definitely took some risks by not fully resting our girls and, in some cases, completely changing events. The girls knew they would have to dig as deep as they possibly could, against a field of swimmers — many of whom were fully rested — in order to advance to the state meet. Middleton will certainly be a motivated bunch now. Not only are the Cardinals trying to win a third straight title, they’ll do it shorthanded. And after the way sectionals ended, they’ll do so with added motivation. “Through the looks of defeat and the tears, there were looks of sheer determination and fire,” Cabalka said. “We have a lot of room to move up and plus points. “The girls will complete their taper cycle this week and enter the state meet fully rested — and I know we will see some magic happen. The road is never easy, but where's the fun in that? Team scores: Middleton 317, Sun Prairie 312, Madison West 291, Verona 289, Madison Memorial 250, Waunakee 175, DeForest 124, Milton 89, Madison La Follette 82, Janesville Craig 62, Beloit Memorial 51, Oregon 40, Madison East 34, Janesville Parker/Evansville 32. Diving—1. Leah Mickelson (West) 358.1. 200 freestyle—1. Hannah Aegerter (Middleton) 1:52.02. 200 individual medley—1. Grace Bennin (V-MH) 2:04.08. 50 freestyle—1. Sophie Fiske (Sun Prairie) 23.79. 100 butterfly—1. Katrina Marty (West) 55.36. 100 freestyle—1. Fiske (Sun Prairie) 52.04. 500 freestyle—1. Aegerter (Middleton) 5:00.76. 200 freestyle relay—1. Sun Prairie 1:36.79. 100 backstroke—1. Marty (West) 56.29. 100 breaststroke—1. Bennin (V-MH) 1:03.14. 400 freestyle relay—1. Sun Prairie 3:28.5.